1. Time setting: Press A key for 3 seconds to set hour mode, press B to adjust hour value; then press A key to set minute mode, press B to adjust minute value, then press A key to confirm and exit time mode. When setting, if there is no operation for more than 60 seconds, it will automatically confirm and exit the setting mode. 2. In the non-setting state, press the light button to display the blue light; press and hold the light button for 5 seconds, the backlight will change from full light to half light (saving power function), release the button, the brightness will automatically turn off for 4 hours. 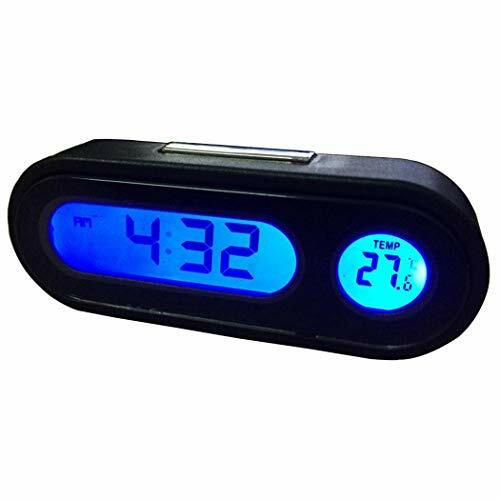 This Digital Clock and Temperature Gauge can used for many indoor place such as car Home and office ect. Please feel free to contact us if you have any question, we will solve it for you as soon as possible. The product will be replaced or refunded free of charge within 1 month, so if you do not like the package, please contact us in time, don't worry about filling out the evaluation, thank you very much, our after-sales service is very perfect, I believe you will be satisfied. * TOOGOO is a registered trademark. ONLY Authorized seller of TOOGOO can sell under TOOGOO listings.Our products will enhance your experience to unparalleled inspiration. TOOGOO(R) LCD Display Digital Electronic Clock With Sucker LED for All Cars Indoor Outdoor Home Item Type: Indoor/Outdoor/Car Kit Electronic Thermometer Material: Plastic Color: Black font Screen Type: LCD Screen Design Element: Sucker Type Digital LCD time display Application: indoor/Outdoor/Car Size: Above 9.3*3.3*2cm Weight: Above 28g-30g Power: Battery (Including) Universal Product: Fits for any car, truck, etc. Tips: Low temperature will reduce the suction,it's better to dip a little water in the place where you want to use it. 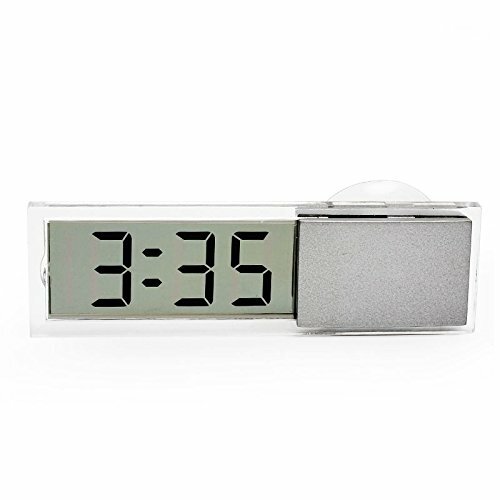 Package includes: 1*Electronic Clock(including the Battery) Only the above package content, other products are not included. Note: Light shooting and different displays may cause the color of the item in the picture a little different from the real thing. The measurement allowed error is +/- 1-3cm. 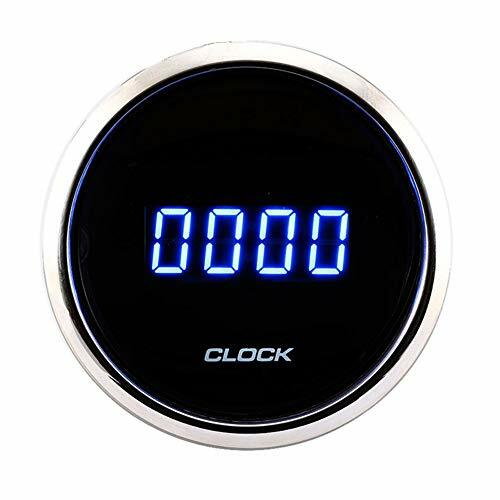 100% Brand New & High Quality,Indoor/Outdoor Kitchen electronic clock.Portable appearance, easy to use. 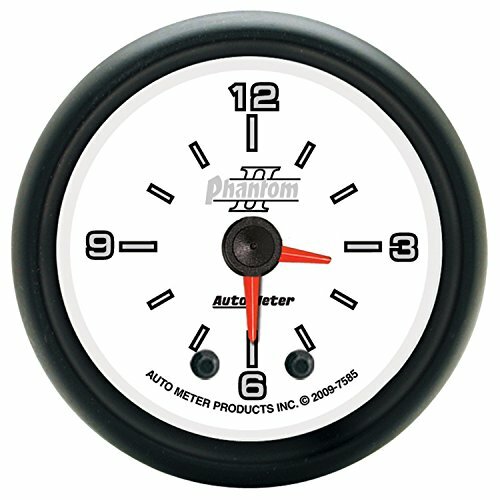 Sucker type clock can be convenient to place it.Easy to read the meter. Low power consumption, long life time.Easy installation, LCD display, fashionable appearance. Transparent glass material, Even if is sucked in the windshield will not affect the sight. Temperature error correction setting range: -5 ~ 5 . Display device adopts imported long life and high brightness LED digital tube, fonts glow is soft and not dazzling. The cigarette lighter plug of power supply design, realize the quick DIY installation, plug and play. 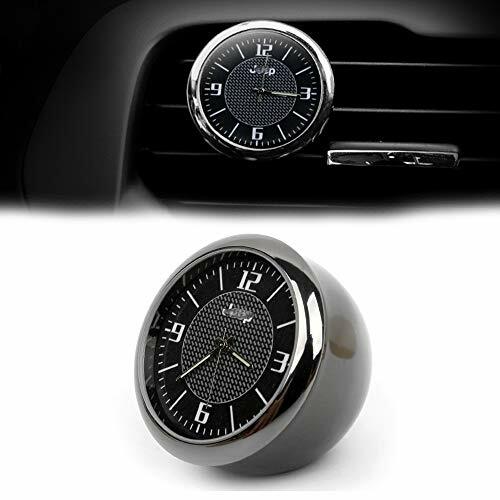 Turn on the car, the car clock screen will show time. Turn off the car power,will disappear. Set time, temperature,voltage of three functions in one. Total 4 kinds of display modes. The temperature voltage display. After the display mode is set up, the next time you do not have to reset the memory function. Manual correction function with temperature error, setting range of -5~5. Built in imports of ultra long life memory battery, the car will continue to go after the failure of power. Car dash clock operation voltage range is DC 8~30V, temperature measuring range is -40~120 , voltage measuring range is DC 8~28V. * TOOGOO is a registered trademark. ONLY Authorized seller of TOOGOO can sell under TOOGOO listings.Our products will enhance your experience to unparalleled inspiration. 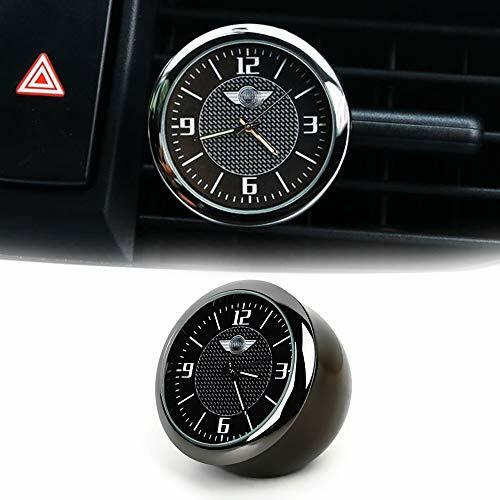 Colour:Black Material:ABS Size:7.5 2.5 1.5cm Package Contents: 1 x Car Electronic Clock Thermometer Only the above package content, other products are not included. Note: Light shooting and different displays may cause the color of the item in the picture a little different from the real thing. The measurement allowed error is +/- 1-3cm. LED digital display,can clearly display the time,date and month countdown,visual effects at a glance. 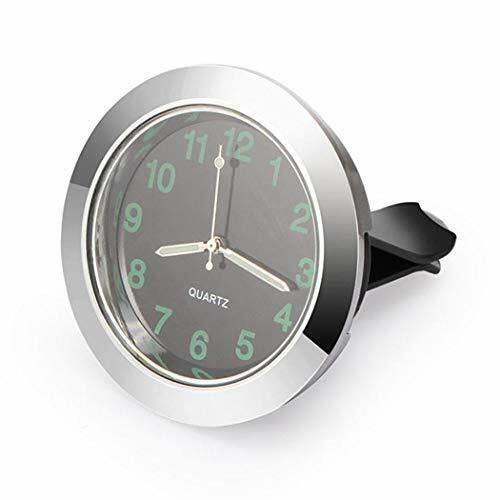 2-in-1 design,electronic clock and thermometer.Support 12/24 hours switching.It can be put on the curved surface,the angle can be adjusted. With a blue luminous design for easy reading at night. Made of premium material,durable enough.Mini size an portable,Easy to install or remove.Universal fit for most cars. -Use moving-magnet principle to drive the needle, featuring good endurance and anti-vibration. 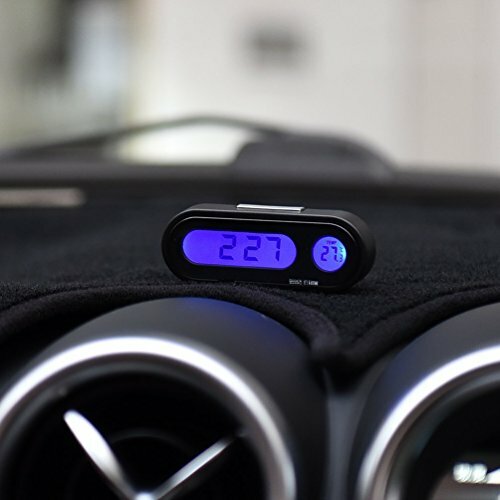 Multi-Function: Built-in Digital Clock and Temperature Gauge.12/24 hours can be switched as you want; also capable to measure temperature from -20 to 50 . LED Backlight: Just click on the screen will show blue light that you can view the thermometer or clock in poor light environment. Easy To Install: Equipped with a installing iron sheet, which can be twist casually,it can be installed in anywhere you want such as Automotive Interior,office, workbench, etc. Safety: It allows you to know the time when driving without glancing at your watch or cell phone, which ensures a safer driving experience. 100% Quality And After Sales Service We offer you a one-year warranty.If you do not like the package, please contact us in time, thank you very much, our after-sales service is very perfect, I believe you will be satisfied. The MGS series introduces a new product, the Digital Gauge. The blue LED display shows clearly in day or night, and the delicate and graceful brightness adds zest to your journey. From the inside out is your best choice. The convex mirror made of acrylic material has a magnifying effect, with a 304 stainless steel bezel. This series has the following features: IP67 waterproof certification, anti-dust, anti-fog, anti-UV dial. The most important of this series uses a pin-type installation, no cumbersome steps, definitely this is what you want. The blue LED display shows clearly in day or night, and the delicate and graceful brightness adds zest to your journey. From the inside out is your best choice. 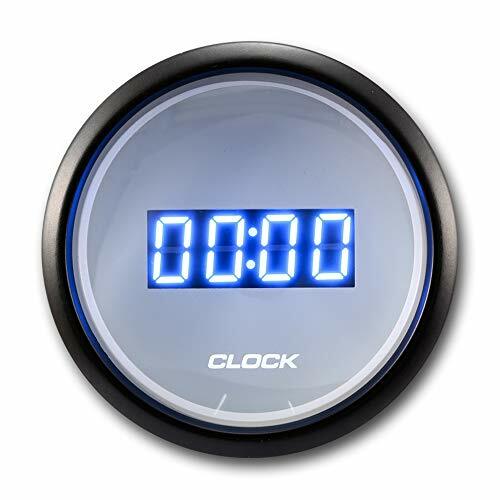 Standard 2" white dial for a 2-1/16" black opening; Blue Digital LED display; 24-hour clock. MGS digital series requires 12-volt negative ground systems. Feature used the 304 stainless steel on the exterior rim and certification for IP67. It included in the packaged switch button, power harness, screw bracket, O-ring, installation manual. We provide after purchase a one-year warranty (non-human factor damage) and free lifetime technical support. This combo package includes one clock, one panel trim, and our EXCLUSIVE GERMANY MADE magic cable. For further fitment details please feel free to contact us so we can verify the fitment for you. 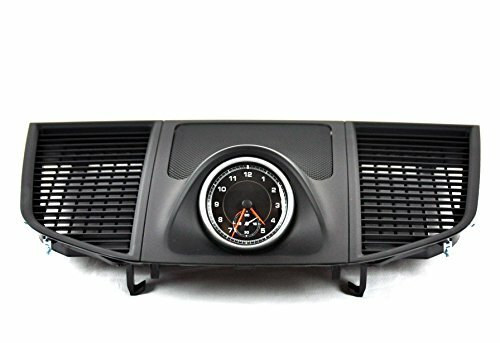 Clock and Panel Trim are 100% Porsche OEM Genuine Authentic Guaranteed. Quartz Movement. With Second Hand. The luminous function enables you to see the time clear at night. The mill finish shell and plating process make it waterproof and durable. Size: Approx. 5.2 * 4.4 * 3cm/2.05 * 1.73 * 1.18inch(L * W * H). Fits for 7/8 and 1 handlebar and it is easy to install. 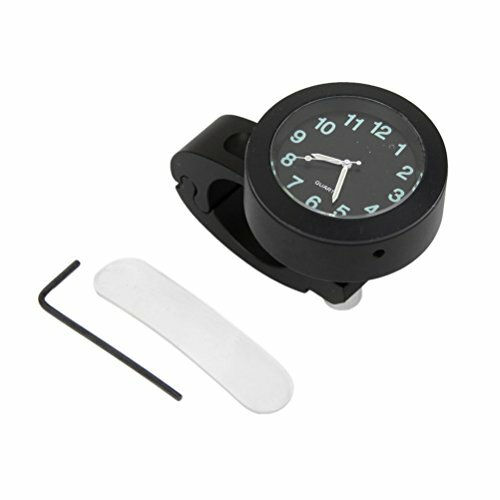 Mini size and easy to install,work great for checking time. It works for 12 Volt DC. Brand: PA | Manufacturer: Per-Accurate Inc. 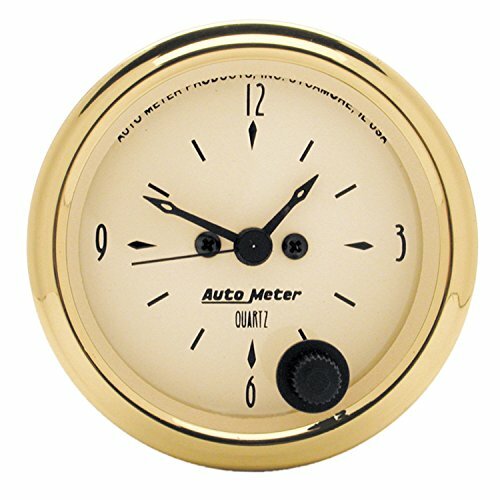 These Auto Meter American Muscle analog gauges feature advanced hybrid dial technology. They combine Auto Meters signature white high-definition LED illumination and glowing red pointers for maximum readability. 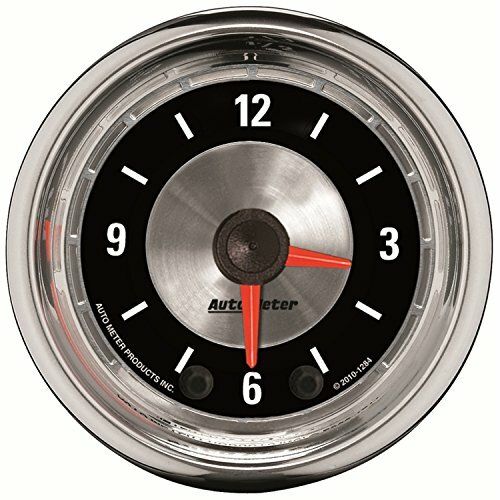 They have authentic spun aluminum dials featuring embossed details and chrome bezels for a unique, classic look. 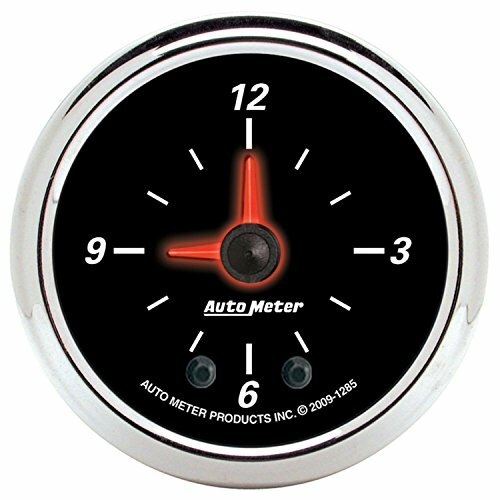 These Auto Meter American Muscle analog gauges are sure to change the look of your vehicles interior. 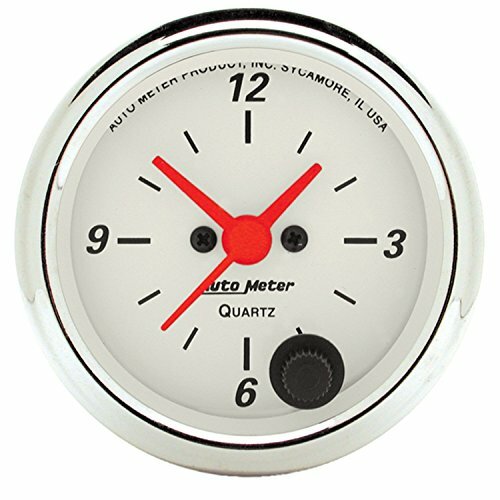 Gauge, American Muscle, Clock, 2 1/16 in., Analog, Electrical, Each. 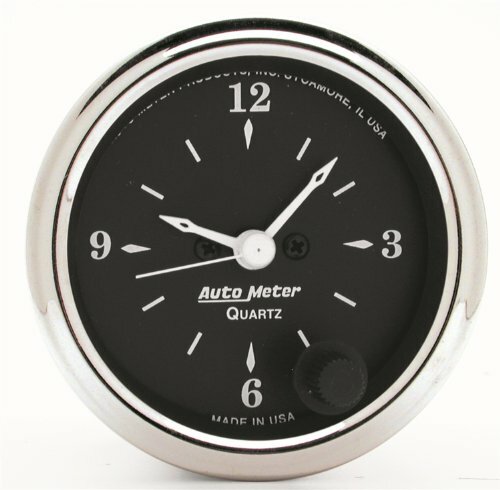 This is a 52mm high quality analogue clock, for automotive use, made from parts imported from usa. This has a push knob at 5 oclock position to reset the clock. 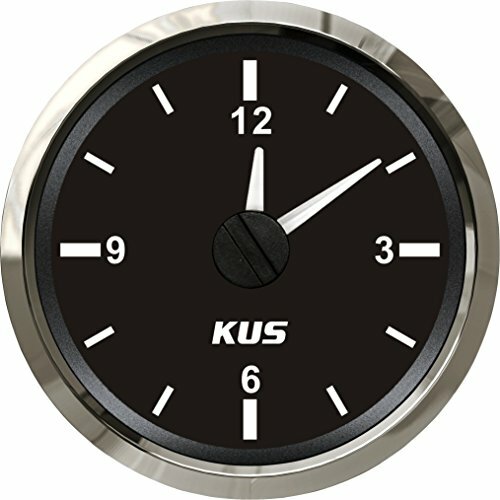 This has a chrome bezel, black dial, 12v. Suitable for car, indoor and outdoor use. 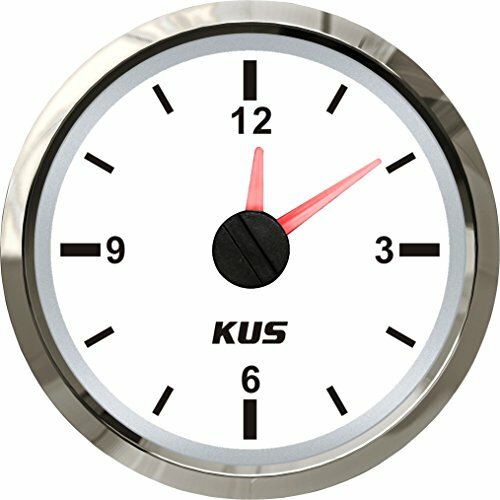 Luminous LED electronic clock thermometer. 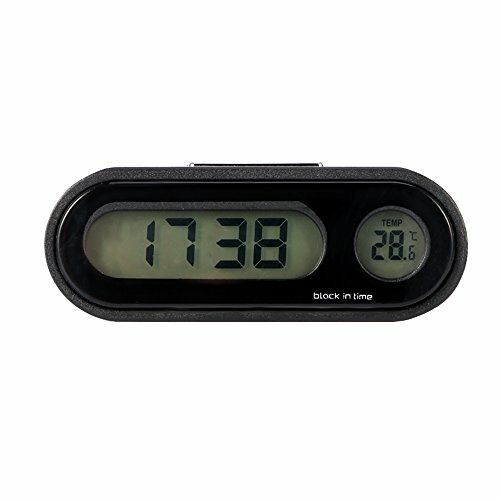 Digital clock thermometer can make you feel more convenient. Feature: Suitable for car, indoor and outdoor use. 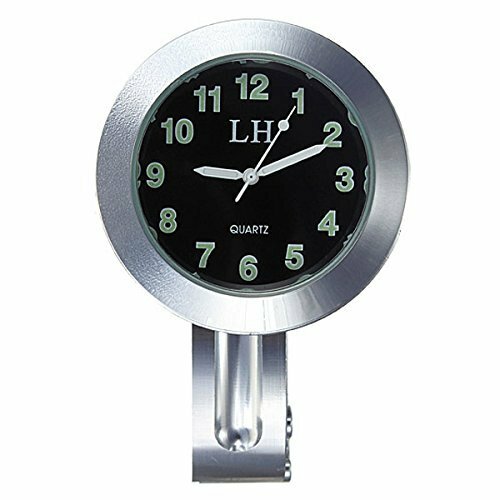 Luminous LED electronic clock thermometer. Digital clock thermometer can make you feel more convenient. Small and classy, good-looking mini design. Install on car air vent with the clip, easy to install. 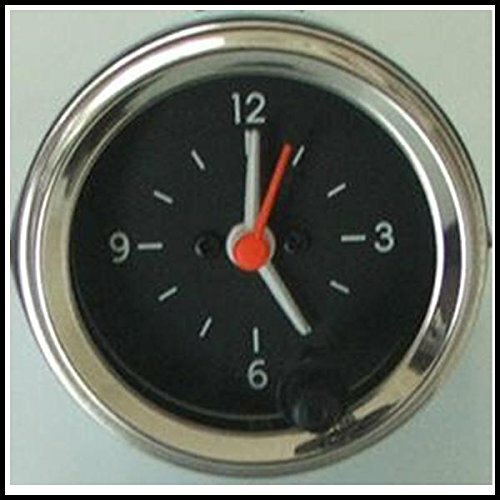 The clock also can be installed in anywhere you want like office, workbench, or locker. [Service] Welcome to the RichTop shop. We offer Free Return and Exchange. As a new shop,our service and our product quality are very good. We always put custome satisfaction first. If you have any questions, please contact us by email. We will respond within 24 hours. 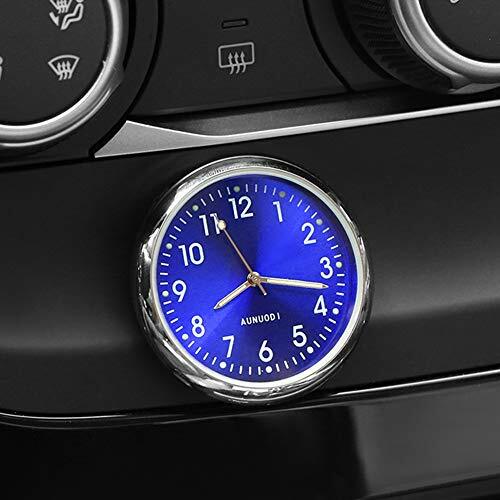 2 in 1 Multi-Function: Built-in Digital Clock and Temperature Gauge, driver can clearly the time and temperature conveniently to arrange the driving time appropriately. 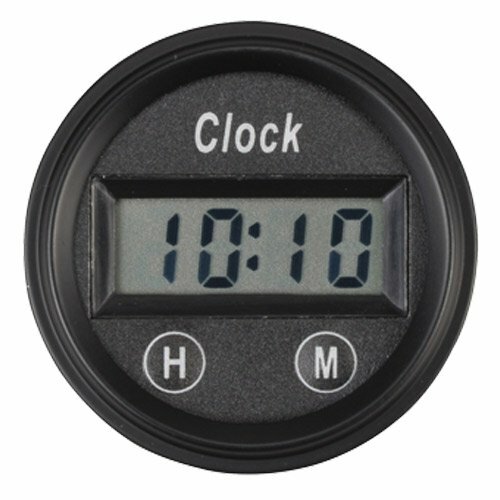 Large- LCD screen, you can clearly display the time, date and the second, visual effects at a glance. 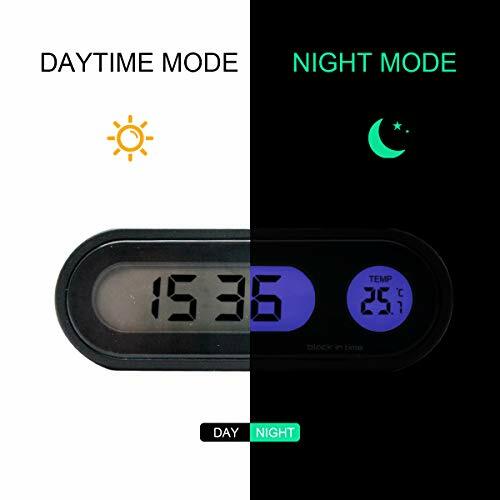 With blue luminous, you can easily learn the current time at night just one click. 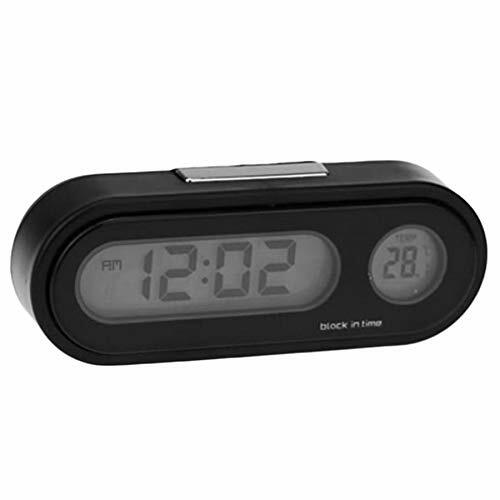 Exquisite Fashion Design: Dot-matrix LCD electronic clock, full of science and technology, beautiful and delicate streamlined appearance. 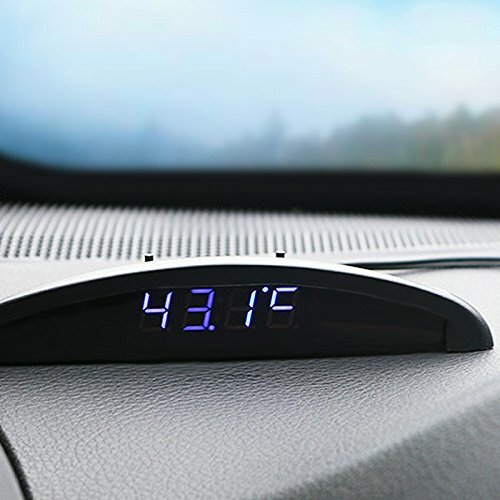 Easy Install: It can be directly fixed on the dashboard panel, you can also use the clip placed it on the air conditioning outlet wind deflector, it can be installed and used in the car and office conveniently.